The process of applying for a mortgage can be time consuming and complicated and this is why professional advice from your Blackstone adviser is so important. During your consultation your adviser will need to look at all your documents to review your income and your expenditure before making a recommendation based on your individual needs. Before you apply for a mortgage we recommend you do your sums and compile a list of all your income and your outgoings. 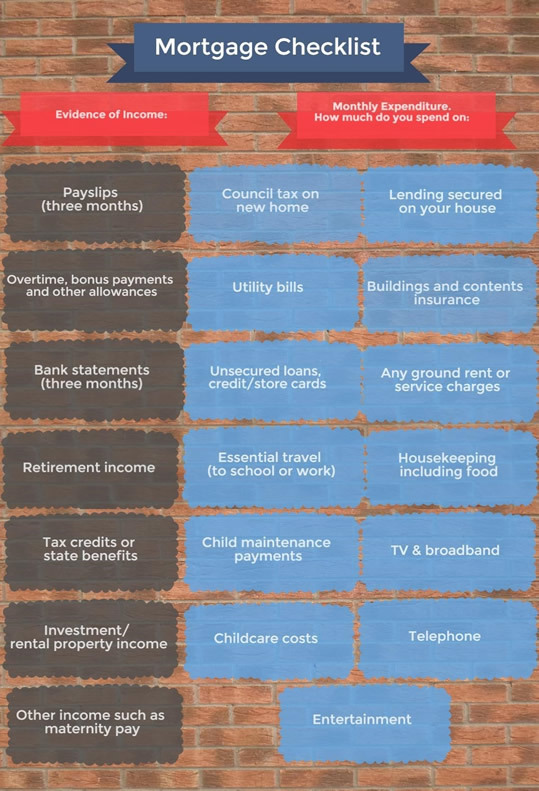 Make sure you include all your household bills and your regular expenditure, including all of the items in the chart below so that you can decide how much you can afford to borrow. Don’t forget to factor in an amount for protection such as life, illness and home insurance, which will help secure the future of your investment. Before a lender agrees your loan, they will check thoroughly that you can afford the monthly payments, that you can manage increases in interest rates, and they’ll look at your outgoings as well as your income. Your Blackstone adviser is a qualified professional who will pick the best products from the whole of the market and a mortgage that best suits you, your budget and your new home. Here’s a useful checklist of the details you should have ready and expect to provide your adviser during your mortgage consultation. Please have your evidence of income, bank statements and monthly expenditure information to hand for your appointment. If you are self-employed it’s a good idea to obtain your three years SA302 tax summary documents from your HMRC online account or your accountant as soon as possible. View or download a Pre-appointment checklist and print a Credit commitments capture form to summarise your loans and balances owed and your usual monthly payment. You will need to evidence your savings and the amount of money you will put into buying your home (i.e. your deposit). Usually the larger your deposit the more favourable your interest rate might be. This list is not exhaustive so always disclose all relevant facts and details to your adviser so that you get comprehensive mortgage advice relevant to your individual situation. Contact Blackstone Financial Solutions now for a free, no-obligation initial consultation and take away the stress of finding and arranging your mortgage. "Khalid is awesome, we are living the dream thanks to his excellent financial advice. He is very professional and always willing to help explain the details in a way we could understand; doing all the paperwork and helping us achieve our dream home. We can't thank him enough. Many thanks Khalid; when our great fixed term mortgage is due we will be back in touch."